At every game conference, when you retrieve your credentials, you also get a totebag filled with stuff. And the stuff is usually all junk. 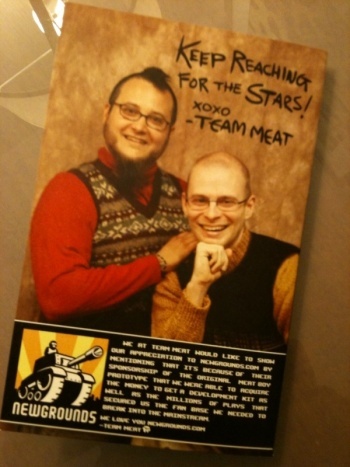 This year's GDC is no exception. 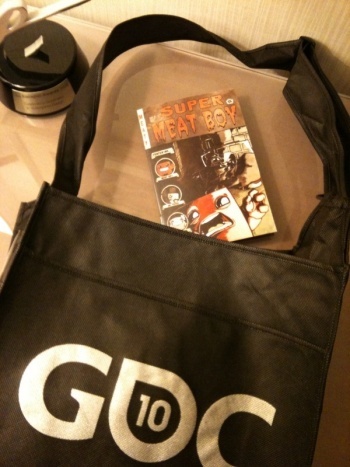 The official GDC 2010 tote bag is filled with advertisements for all sorts of stuff nobody cares about, but careful swag sifters will also discover a shiny jewel in the rough: the Super Meat Boy comic book. 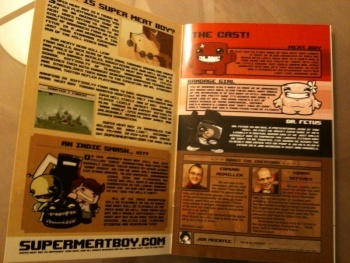 Super Meat Boy is the mainstream update to indie darling, Meat Boy, developed by Team Meat. In both games you play as a cube of meat, striking out to save your girlfriend (Bandage Girl) from the evil Dr. Fetus, a fetus in a jar wearing a tuxedo. It's a bizarre, otherworldly experience that's also tons of fun. 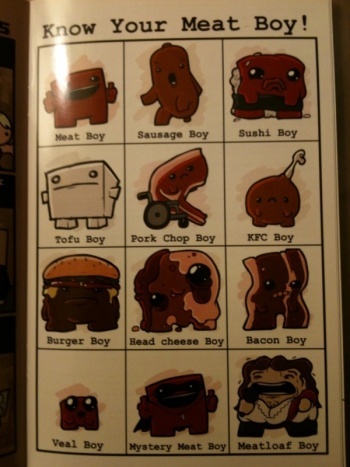 In the comic book you will learn the back story of Meat Boy, discover how to identify your different types of meat boy and learn new uses for the critter, as well as many, many other things. It's easily the most intriguing item I've ever found inside a convention swag tote, and the coolest advertisement for a game I've ever seen. Pics below. 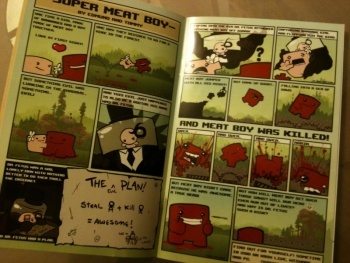 Super Meat Boy will be available later this year.